Taíse Pinheiro defended her PhD thesis about forest degradation, advised by Maria Isabel Escada. The author did a detailed analysis of two Amazon frontiers of the 1970s and 1990s using 28 years (1984 to 2011) of Landsat images. She did two case studies: (a) Novo Progresso, Southwestern Pará, where logging expansion started in the early 2000, and (b) Sinop, Northern Mato Grosso, Brazil, currently a consolidated frontier. In Novo Progresso, from 1984 to 1997, 90% of degraded areas were completely deforested in one year's time. From 2004 onwards, due to increased command and control measures, less degraded areas were completely cut. About 40% of the degraded areas were not completely cleared, leading to large areas of persistent degradation. In Sinop, the transition from degradation to deforestation lasts longer, with a typical period of 7 years (50%). Forests are revisited by loggers before forest conversion into clear-cut. In both frontiers, forest degradation was typically characterized by low to moderate intensity forest damage. Although a large proportion of logged forest was deforested, 40% of the degraded forest areas were not completely deforested. The work shows that persistent degradation is happening in Amazonia to a greater extent in the recent years than in the past. Taíse Pinheiro. 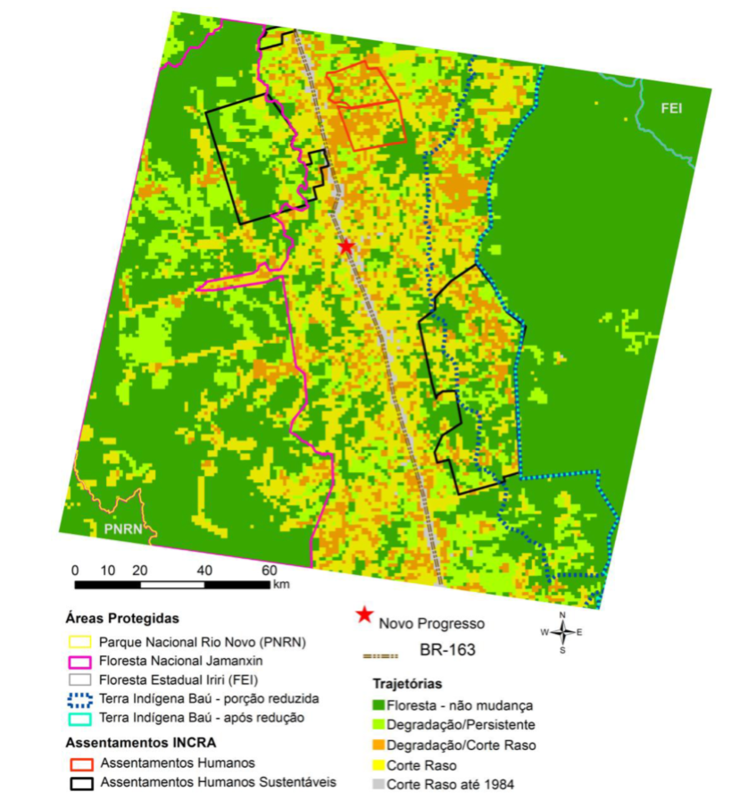 Padrões e trajetórias de degradação florestal em fronteiras madeireiras da Amazônia (Patterns and trajectories of forest degradation in the logging frontiers in Amazonia). Doctoral dissertation in Earth System Science, INPE. Viva: 17.12.2015. Advisor: Isabel Escada.